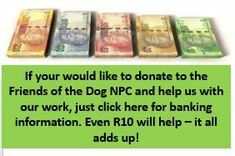 We need your help financially to help the dogs in shelters - we are raising funds to improve their quality of life, make them more adoptable, ensure that they end up at right home, and that new owners get the education and help they need to ensure the adoption is successful. 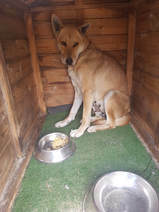 This is being done independently from the shelters, there is simply never enough monies available at shelters for this type of work, so the only way we can make this possible is to raise funds ourselves. In order to achieve this this we have opened up to Sponsorship on our website. This ranges from a Classified Sponsorship Advert at R500 per annum, through to website sponsorship from R550 to R2200 per month. This is not just an advert - there is so much more offered, including articles featuring your Logo and Infomercial, free classifieds etc! We average between 5500 - 9500 unique visitors per week, which translates to 15500 - 35000 pages read per week. 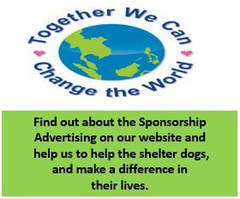 Best of all is that you are having your products marketed to your target market PLUS you are helping to make a dogs life in a shelter better, make them more adoptable and the chances of a successful adoption higher. Thank you and please do share. Due to the vast amount of mis-information and incorrect advice that was available on various media platforms, our initial aim was to have a website geared towards knowledge and information and a reliable source of information for all dog owners. 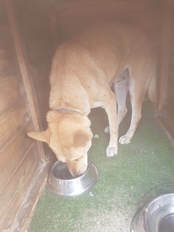 This was based on behaviour and all things dog, and on the 14th Feb 2011, Friends of the Dog was born. We now have over 1400 articles and all the Tabs you can see on the site including Breed Compatibility and help for new owners. We started the FOTD Shelter Initiative Tab on the website which was aimed at supplying basic knowledge to people adopting. We started the Canine Behaviour Shelter Courses and have been running these over the last 18 months in both Jhb and Cape. These courses give staff, volunteers and anybody that want to know about working with dogs in shelters the tools they will need. Our methods are designed to lower the stress found in shelters, make the dogs more adoptable by teaching basics exercises and give the shelter the tools to bring in one-on-one sessions etc. Several of the participants on the above course, have taken the work further and started the initiative at their own shelters as well. This is done independently, but with us all working together to achieve a common aim. Some of these participants have also taken their own knowledge further and are studying canine behaviour so that they can help dogs and owners further. At the shelters involved in this initiative, we are matching the right dogs to the right homes and ensuring that a good match to any existing dogs. We are giving owners a one-on-one behaviour session before they take the new dog home. We supply the owner with comprehensive notes to help them. We keep in touch to help with any problems encountered. 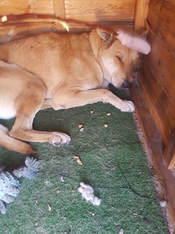 We are building play/work areas so that dogs in the shelter can have more mental and physical stimulation. We are building a new run for introductions, where dogs can be worked on one at a time. We are starting to build smaller runs (where dogs can be kept by themselves or in two's while being worked on. This makes it possible to supply the dogs with chew items and toys to provide additional stimulation. It is also virtually impossible to do this when you have 5 - 7 dogs in a run together. All dogs on the initiative are being walked and exercised a few times a week and their skills and behaviour improved. We are aiming to build more separate runs and also to employ staff which will be trained and work daily on the dogs in the initiative. 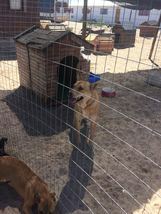 We are also working on dogs in the shelter with fear behaviour and helping them to become more confident so that they can be adopted. 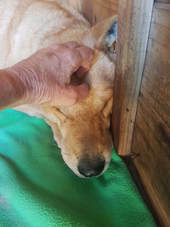 Bu the end of the next session, she was allowing us to touch her with our hand - had come closer to the front of the kennel. At the end of this session, while we were sitting quietly outside her kennel, she stood up and started eating for the first time! What happened next had us in tears of joy - after her session and we had just left her run, she happily came running up and straight to the fence where we were standing and started taking treats from us! This gorgeous girl still has a way to go, but she is now starting to interact with strangers and walking on lead.